National Review echoed the thought with a similar assessment: “It’s generally agreed that Thad Cochran squeaked out a win in Mississippi last night in part by getting Democrats, especially African Americans, to turn out.” Harry Enten of FiveThirtyEight completed the exhaustive (and fascinating) data-mining showing how Cochran’s victory correlated to black turn-out and later reported that a Cochran victory was not as implausible as pundits initially predicted. 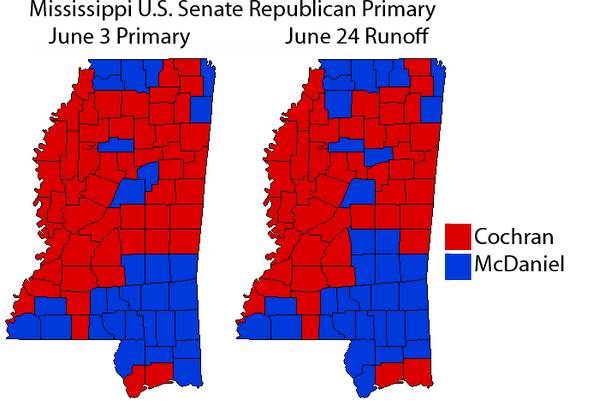 Mississippi State’s Stennis Institute produced numerous post-runoff maps including the one below. The colors show the vote difference between the primary and runoff for each county while the elevation shows the voter turnout. 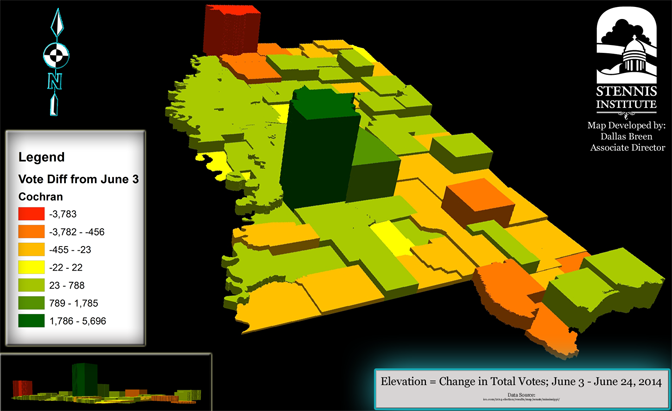 Turnout in DeSoto County increased in support of challenger Chris McDaniel but was overshadowed by the dramatic increase in Hinds County in support of Cochran. The author counted 6 counties that shifted from one candidate to the other but the most significant was in Jackson County which netted more than 700 more votes for Cochran. Tea Party Republicans are shocked at the Cochran campaign’s attempt to disparage a fellow Republican Party member. The election results and campaign tactics demonstrate the divide between establishment and Tea Party Republicans and will likely shape both the ethic and ideology of future campaigns, especially when facing an ideological purist from within one’s own party. 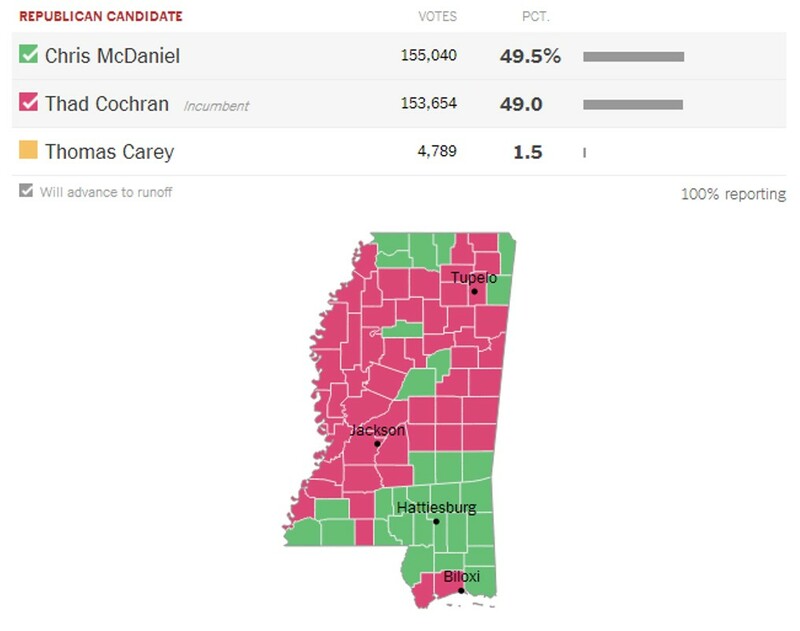 Of particular interest to the McDaniel campaign was the turnout in Hinds County, which Cochran won by nearly 11,000 votes Tuesday. By contrast, Cochran won the county by 5,300 votes on June 3. Just under 25,000 total ballots were cast in Hinds County Tuesday, while 16,640 total ballots were cast on June 3. On Fox New Channel’s “Hannity,” McDaniel stated that he intends to verify the number that voted in the June 3rd Democrat primary and illegally voted in the Republican runoff. 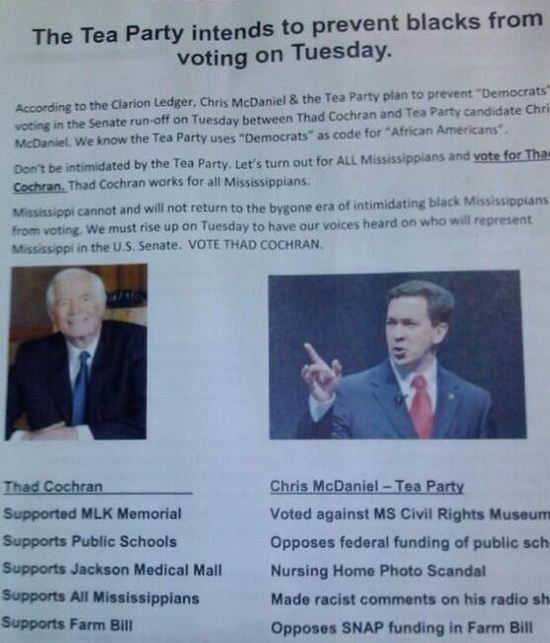 The Flier That Got Thad Cochran Elected? The runoff election night speeches of Sen. Thad Cochran and Chris McDaniel are posted at C-SPAN and linked to below. In less than 2 minutes (total clip is his 3:11), Cochran thanked his supporters and declared his victory a triumph for the people and “a consensus for more and better jobs for Mississippi Workers” and a strong military force. See the entire speech at Senator Thad Cochran Primary Victory Speech. Continuing his theme of fighting for our country, McDaniel refused to concede in a runoff night speech over 9 minutes long. Declaring that there is nothing extreme about balancing the budget, defending the constitution, or fighting for traditional values, McDaniel asserted that the conservative movement was hijacked by Democrats who determined the outcome of the Republican primary. See the entire speech at Chris McDaniel Primary Night Speech. The Associated Press declared Sen. Thad Cochran the victor in Mississippi’s heated Republican Primary for the U.S. Senate. With 99.9% of precincts reporting, Cochran led with 50.8% of the vote and just over 6,000 more votes than Chris McDaniel. The June 24th runoff was truly remarkable with more than 60,000 votes being cast than in the June 3rd Primary (in an off-year election, no less). CNN reported, “Cochran’s backers turned to Democrats, especially African-Americans, who make up 37% of the state’s population.” Breitbart added, “[A]allegations flew that Cochran allies were using ‘walking around money’ to incentivize Democrats to the polls. Democratic Party Chairman Rickey Cole, for instance, said Cochran operatives were paying people in the black community to donate to Cochran.” Such reports may inspire a McDaniel challenge since anyone who voted in the June 3rd Democrat Primary are ineligible to vote in the Republican runoff in accordance with state law (Mississippi Code § 23-15-575). In accordance with Mississippi Code § 23-15-599, the Republican Party must certify the primary election vote by July 4th (within 10 Days of the election). The race for the Republican nomination for the Mississippi U.S. Senate seat is redrawing the political landscape. Senator Thad Cochran’s seniority would be expected to keep federal dollars flowing into the state but it is just that reputation that is fueling the Tea Party opposition and candidacy of Chris McDaniel. Since the June 3rd primary in which neither Cochran nor McDaniel were able to garner more than 50% of the vote, Cochran has increased his efforts and is even appealing to Democrats who did not vote June 3rd. He is also emphasizing how his influence has ensured the growth and stability of military bases across the state and Huntington Ingalls Industries (HII) in Pascagoula. DefenseNews reports that such influence may not be all positive as efforts to add another LPD to HII’s workload may cost at least one future ship based on a 2002 agreement. While McDaniel has bashed excessive federal spending as bankrupting our country, Cochran supporters have stated that such spending is vital to Mississippi’s economic vitality and quality of life. For years, economic conservatives have argued that so-called establishment Republicans are merely “Democrat-light” with no clear distinction with the policies from across the political aisle. Mississippi will settle this round of arguments in the runoff election on Tuesday, June 24th. Anyone who voted in the Republican Primary or did not vote can vote in the runoff; only those that voted in the Democrat Primary are unable to. E.J. Dionne, writing for the Washington Post, identifies Mississippi’s personality disorder with respect to federal funding. As a “conservative” state, Mississippi rejects federal waste, unbalanced budgets, and pork. At the same time, the state benefits from, if not relies upon, federal money. The U.S. Senate primary race between Sen. Thad Cochran and state Sen. Chris McDaniel is forcing the issue. Cochran has made a name for himself as a master appropriator and is in line to chair the powerful Appropriations Committee should the Republican Party take the Senate in November. McDaniel has fashioned himself a warrior against federal debt, excessive spending, and pork and has won the support of a host of Tea Party groups advocating the same. U.S. Senate primary results by county (courtesy of the New York Times). Click to enlarge. The New York Times graphic to the left shows the county-by-county split in Mississippi’s June 3rd Republican Primary election for the U.S. Senate. For more in-depth statistical analysis, see the Washington Post website which provides interactive color-coded maps by vote percentage and vote margin in each county. June 24th is the date for Mississippi’s runoff election. Everyone in Mississippi can vote in the runoff except those that voted in the Democrat primary on June 3rd. Thomas Carey, the third candidate who pulled enough votes in the Primary Election to force a runoff, became the most famous unknown in Mississippi politics by forcing the mud-slinging into another 3 grueling weeks. Cochran’s long record of voting for things that conservatives hate, like tax hikes, Medicare expansion and the Department of Education, puts his conservative bona fides in doubt in an era when the very definition of “conservative” — or rather, of “acceptable conservative incumbent voting behavior” — is changing. Republicans have always claimed to be for individual liberty, fiscal common sense and constitutionally limited government, but the five-year-old tea party movement has tried to get GOP incumbents to actually vote that way. To progressives, Cochran and McDaniel must look like just another pair of right-wing white Southern Christian peas in a pod, voicing the same conservative boilerplate on almost every current issue. But to those who are actually engaged in the fight, the difference boils down to the willingness to fight, to draw and hold lines in the sand. And there Cochran has nothing to offer. He has never been a fighter and won’t ever be. But McDaniel might. Exactly. The “tea party versus establishment” fight pits pro-business Republicans against pro-market Republicans for control of the future of the party. Will the GOP fight for smaller, constitutionally limited government, or keep going along with ever-growing, never-limited government? Ed Morrissey at Hot Air doesn’t worry about any latent impact on the General Election in November since both McDaniel and Cochran drew 4 times as many votes each compared to all Democrat votes cast in their primary. McDaniel established his statewide credibility and may even cause some Cochran voters who questioned McDaniel’s gravitas to switch their vote. RT @JackieBodnar: RT @mollyesque: FreedomWorks’ Matt Kibbe on boosting McDaniel in runoff: “We’re all in. We’re going to double down." Even if [Republicans could lose the Senate race in Mississippi], and Democrats picked up the seat held by Thad Cochran, it might be a better outcome for the GOP than keeping the disappointing Mr. Cochran in office. The NRSC fails to understand that a bad Republican can actually be worse for the party — and for America — than a Democrat. When someone like Mr. Cochran votes for tax increases, hikes spending and combats efforts to limit government, they both function as an additional Democratic vote in Congress anyway and damage voters’ perceptions of the Republican brand. As a result, they cost the GOP both policy victories and elections. For the myriad of state officials that endorsed Sen. Cochran, this is a worst-case scenario. Is it time to mend fences or expend more political capital? One thing is for certain: Except for political junkies, no one expected, let alone wanted, a runoff in this race!